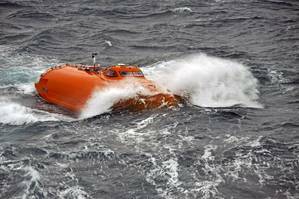 Maritime safety equipment manufacturer and global service provider VIKING Life-Saving Equipment A/S has acquired Norsafe, the Norwegian boatbuilder whose lifeboats are used throughout the world. The parties have not disclosed the sales price, and closing is expected October 1, 2018. Established in 1903, Norsafe produces a full range of free-fall lifeboats and fast rescue boats with davits and have supplied over 28,000 lifeboats to the global ship market over the years. Its lifeboat products are manufactured in accordance with the latest SOLAS requirements and approved by national and certifying authorities for both ships and offshore use. "This is a very close operational and cultural fit," commented VIKING CEO Henrik Uhd Christensen. "Like VIKING, Norsafe has been family-owned for generations, which creates strong and lasting relationships with customers - and it places the same emphasis on quality, on the use of advanced materials and on technological innovation as we do." With the Norwegian manufacturer's 24/7 service network providing lifeboat maintenance from over 300 ports worldwide, the Norsafe acquisition adds further fuel to VIKING's focus on answering new demands for full-scope solutions by providing the world's most comprehensive safety solutions, encompassing everything from products and services - including long term Shipowner Agreements - to design, installation and training. And VIKING expects new efficiencies to be won not just from integrating the two companies' product lines and widening customer choice, but also from leveraging complementary supply chain and production capabilities. "Adding Norsafe's current network to VIKING's extends our already impressive global reach," Christensen said. "And on the training side, with Norsafe's specialized centers in Norway and Greece offering product and STCW courses, VIKING's training arm will also receive a boost to its ability to help vessel and offshore asset owners manage crew competencies." Norsafe's CEO, Dag Songedal, said, "Under the VIKING umbrella, we are creating a more robust and more capable business model that will ensure we can continue to advance our ability to protect people at sea with compelling lifeboat solutions. The safety equipment industry is consolidating to offer shipowners and offshore asset owners greater economies and efficiencies of scale."